Fully updated and expanded, the second edition of this popular text covers all the main causes of acquired speech and language disorders in childhood. 25 cases of children with these disorders are described and their management explained in detail, most from onset and including long term outcomes. New features of the book include a chapter on speech and language disturbance due to cerebral tumour and the treatment of childhood cancers, as well as an expanded chapter on cerebral infection that includes recent work on children surviving cerebral malaria, one of the largest causes of cerebral infection world-wide. The book is suitable for all who want to update and expand their knowledge of these conditions, both undergraduates and postgraduates, particularly speech and language therapists, but also psychologists, teachers and others. Janet Lees, Great Ormond Street Hospital, UK. Chapter 1. 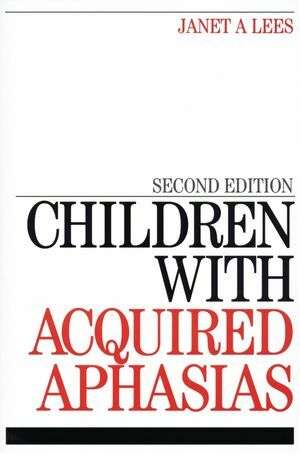 Introduction to the acquired aphasias of childhood. Chapter 2. Assessment of acquired speech and language problems in children. Chapter 3. Management of acquired speech and language problems in children. Part Two: Specific causes of ACA. Chapter 8. Cerebral anoxia and prolonged coma. Chapter 10. Other Epileptic aphasias. Chapter 11. Other deteriorating conditions of childhood affecting speech and language. Appendix 1. Norms for the graded Naming test.